Welcome to Watch. Connect. Read., Tricia! I met you at Anderson’s Bookshop during your book tour for What Happened on Fox Street! Please tell us about the four books you’ve published since we last saw each other. 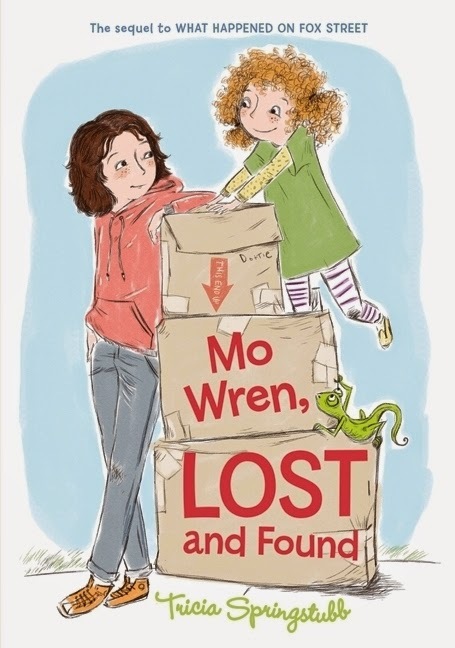 Mo Wren Lost and Found: This is the story of what happened after “Fox Street”. When I finished writing that first book, I really missed Mo and her sister Dottie, and I was a little worried about where they were headed next. I wrote “Mo Wren” to see them safely home. 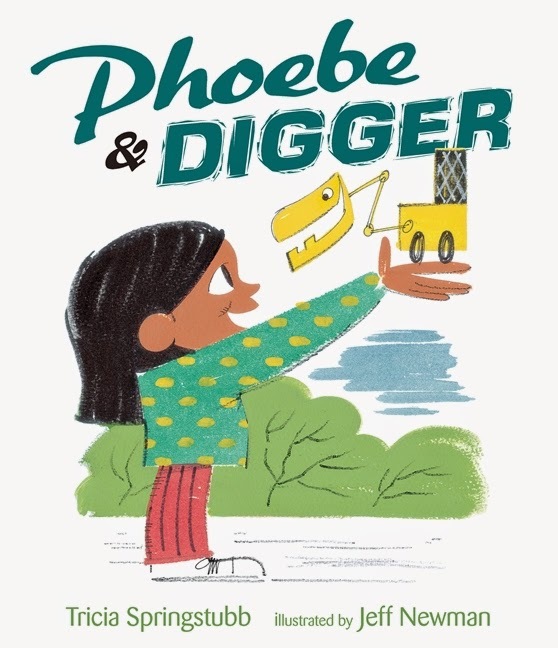 Phoebe and Digger: “When Mama got a new baby, Phoebe got a new digger.” Phoebe and her toy are a powerful duo, till the sandbox bully appears. 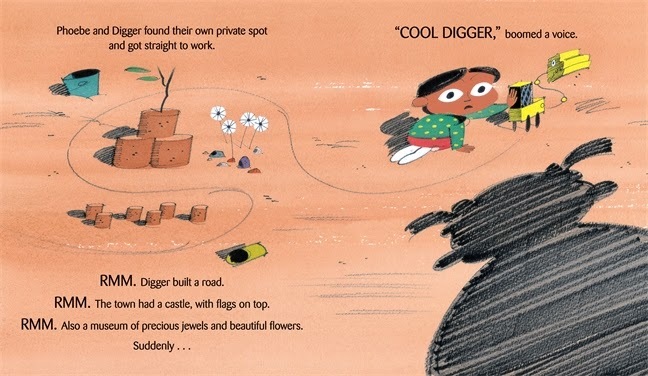 One reviewer called Digger the most expressive steam shovel since Mike Mulligan’s Mary Anne, which just thrilled me, since that was one of my favorite books growing up. 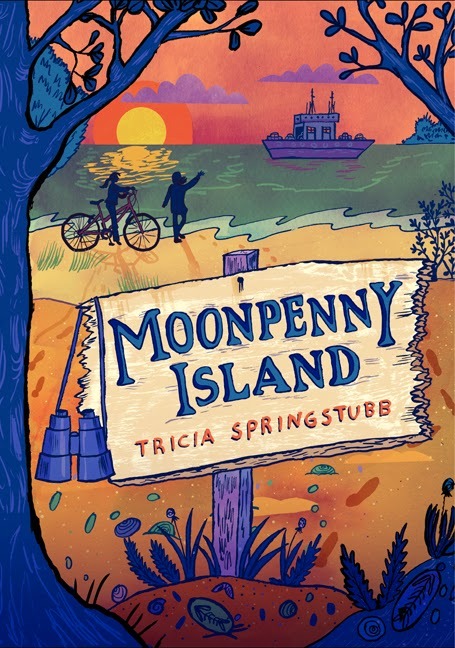 Moonpenny Island: Moonpenny is a tiny island keeping some big secrets. I’ve always daydreamed about living on an island—they’re so mysterious and romantic, with a dollop of danger. The story has a lot about geology and fossils, and I did more research than usual. One of the things I discovered is that evolution is not just about becoming the biggest and fastest. The world needs its quiet, humbler creatures just as much. That became the heart of the story. Cody and the Fountain of Happiness: Cody! I adore her! She never gives up, a trait that leads to lots of adventures (and a trait I wish I had). Cody’s problems will be familiar to most readers—making and keeping a friend, figuring out grown-ups, struggling with right and wrong. Small things on the surface, but huge to a child. This is the beginning of a new series, and that makes my personal fountain of happiness spill over. 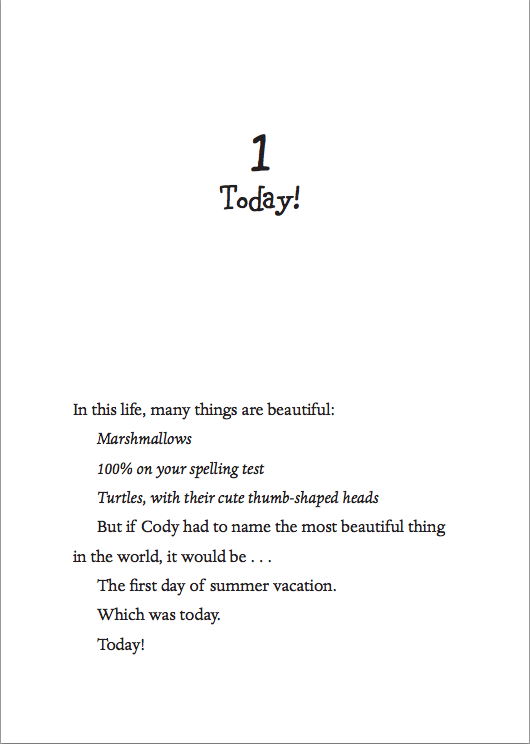 Download the first chapter of Cody and the Fountain of Happiness. 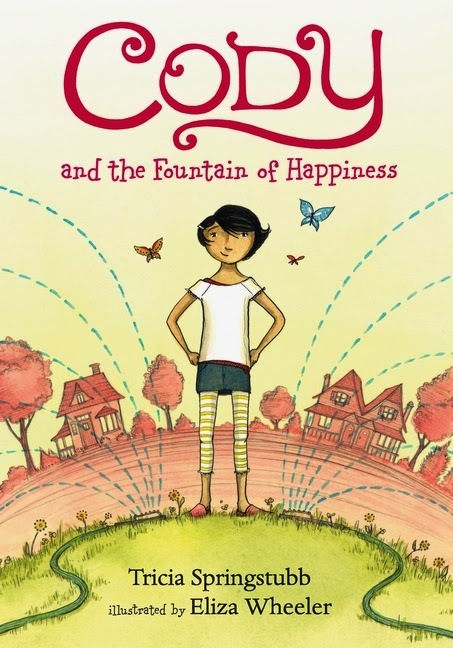 Please share four words that best describe Cody from Cody and the Fountain of Happiness. 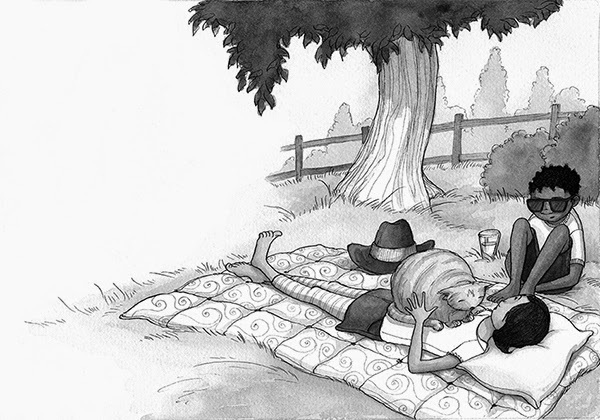 Aren’t Eliza Wheeler’s illustrations gorgeous? How do they add to Cody’s story? Eliza’s art is exuberant and heartfelt, a perfect reflection of Cody. Eliza’s style is witty but warm, sweet but never cloying, exactly the tone I hope my writing has. I love how her pictures spill across the pages--they’re irrepressible, again just like Cody. You’ve worked as a Head Start teacher and a children’s librarian. How have these experiences helped make you the writer you are today? Every experience I have with children re-enforces how important stories are for them. Young readers look for themselves in books, and they also look for who they might become. I’ve worked with so many children who face challenges both big and small, and they always do it with resilience, hope and love. They are small, sturdy heroes! They continually inspire me to write the best, the truest stories I can. 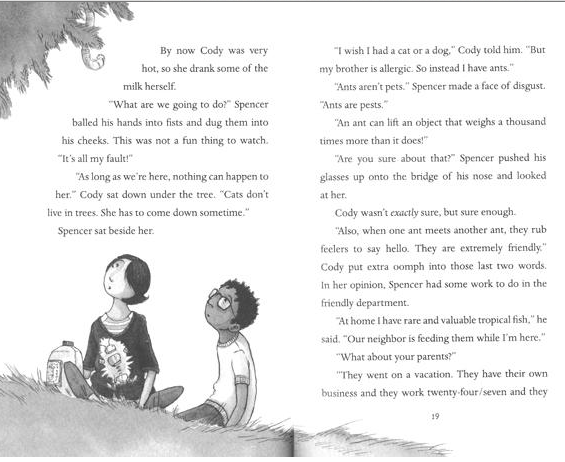 Please share a passage from Cody and the Fountain of Happiness that you read aloud during store or school events. I often read all of Chapter 3, when MewMew is stuck in the tree. “Also, when one ant meets another ant, they rub feelers to say hello. They are extremely friendly.” Cody put extra oomph into those last two words. In her opinion, Spencer had some work to do in the friendly department. “They went on a vacation. They have their own business and they work twenty four/seven and they needed a grown-up get-away.” Spencer took off his glasses. Without them, his face looked naked as a baby bird. A small pain stabbed Cody’s heart. Her dad was a trucker. He was gone for days at a time, and even though she knew he would come back, she always missed him, especially at night. Poor Spencer. Cody scrounged her brain for a cheerful thought. “The lining of your gut replaces itself every three days!” she said. “You act like you know everything,” he said. “That is a very rude comment.” Cody stood up. “I promised to find your cat, and I did. Now I will be on my way.” She dusted her hands together. They both looked up. MewMew was inching down the tree. Headfirst. Her paws scrabbled on the bark, trying to get a grip. A wild look lit her eyes. She was still far above the ground. One slip and she’d plunge to the sidewalk with a terrible, furry splat! 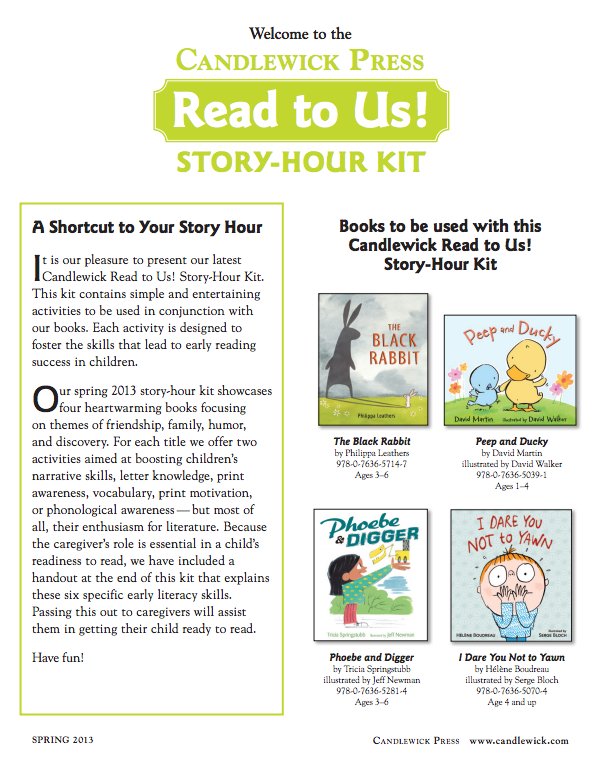 Click here to download this story-hour kit. When I was Cody’s age I desperately wanted a dog for a pet. Instead I got four younger siblings. School libraries are the beating hearts of the whole glorious enterprise. 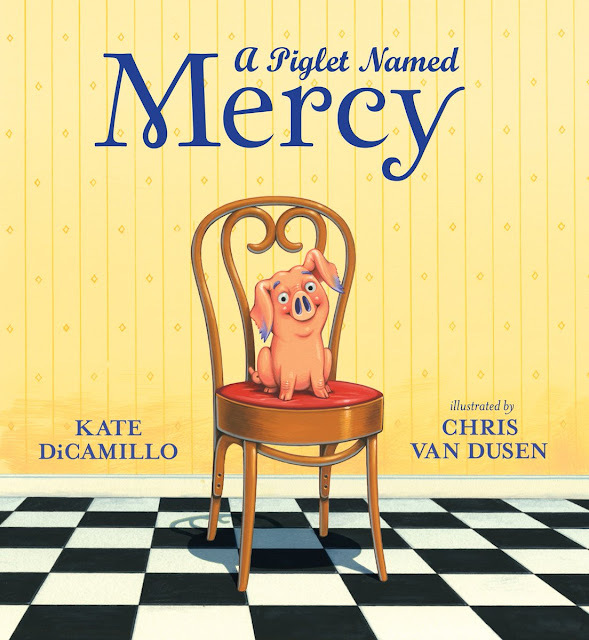 Mr. Schu, you should have asked me what I would be if I couldn’t be an author (a favorite question from kids). Today’s answer is: I’d be the florist delivery person, who drives around delivering beautiful bouquets. I love flowers and I love surprises. Everyone would be so happy to see me! 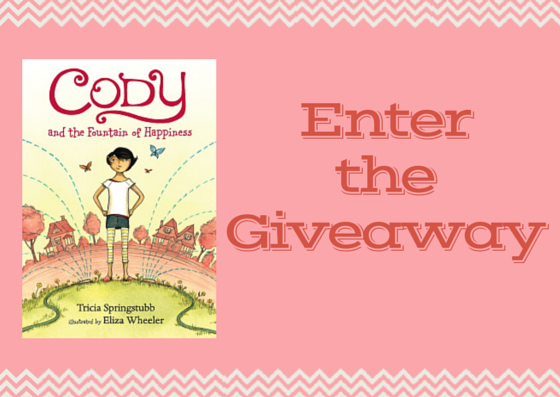 I am giving away one copy of Cody and the Fountain of Happiness. 1. It will run from 4/30 to 11:59 PM on 5/2. Borrow Tricia Springstubb's books from your school or public library. Whenever possible, please support independent bookshops. I'm looking forward to this title too. I LOVED both What Happened on Fox Street & Mo Wren. I own Moonpenny, but haven't yet read it (going through the huge library stack first!). Thanks for the interview!! Young Readers Respond to Dragons Beware!